All the OpenStreetMap Google Summer of Code 2008 student blogs are now on Planet-OSM, the feed aggregator for OpenStreetMap related blogs. This entry was posted in GSoC, Maps, OpenStreetMap on June 8, 2008 by smsm1986. I thought I would checkout how I would get from Edinburgh to the WWDC in San Francisco. 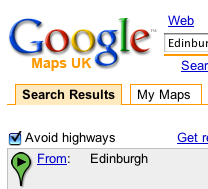 Head over to Google Maps, and search from Edinburgh to San Francisco. Take a look at item 41, which is 3,462 miles long. This entry was posted in Google, Maps on May 19, 2007 by smsm1986. Google have now added a long needed feature to Blogger Blog post creation. This is auto saving of Blog Posts, which is done pretty much the same way as Google Mail. This is much better than the old way of saving drafts of blog posts, which meant that on saving the draft you had to go back to the list of blog posts each time you saved. This was painful productivity hindrance. This entry was posted in Blogger, Google on May 18, 2007 by smsm1986. For those who read this blog, you will notice that it has changed a little. That’s because I now have the new Blogger Beta, which is much better. I’ll slowly be going through some of my older posts to add some labels to them, so it will be easier to find info. This entry was posted in Blogger, Google on October 12, 2006 by smsm1986. The new Google Archive Search is a great tool, with even more potential. The timeline feature is really neat, though could be more customisable. For example being able to show more articles on one page. Here’s and example search for all articles related to Mac OpenOffice in timeline form. This entry was posted in Google, Mac Port, OpenOffice on September 6, 2006 by smsm1986. It would appear from the Google Labs that Google SMS (UK) has graduated from the labs. It used to work. But doesn’t any more! “Google SMS is currently not available in the UK. The service is still in beta, and we’re working hard to make it better. Then you get redirected to the Google Mobile page. Google mobile is not as good, for many things. This entry was posted in Google on August 17, 2006 by smsm1986.